Piano Sonatas Opp. 2, 101 & 106 "Hammerklavier"
Grand Sonata in B-flat major, Op. 106 "Hammerklavier"
Paavali Jumppanen plays Beethoven with pinpoint control and excitement, too. Paavali Jumppanen grabs your attention throughout the three Op 2 Sonatas with impressive lightness (...). Op 101 stands out for the March movement and the concluding fugue's pinpoint control and finely honed balances. Jumppanen is prodigiously gifted, and he provides deeply felt accounts (...). Jumppanen offers an eloquent performance of the Hammerklavier Sonata's Adagio (...). Good recording sound adds to the allure. Jumppanen has collaborated with numerous contemporary composers and premiering many solo and chamber works for the piano. He has worked personally with esteemed composers including Pierre Boulez, William Duckworth, Henri Dutilleux, as well as composers of his native Finland. On the DG recording project of the complete works by Pierre Boulez, Jumppanen recorded the piano sonatas upon the composer's request. 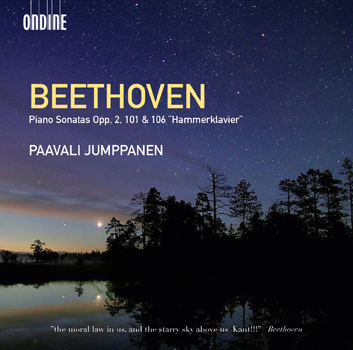 Paavali Jumppanen's first solo piano disc on Ondine is a double-CD which contains five Piano Sonatas by Ludwig van Beethoven (1770-1827), including three early sonatas and the well-known Hammerklavier Sonata. Jumppanen describes the project: "I had spent several years performing the complete cycle of Beethoven's 32 Piano Sonatas and wanted to record that period of my artistic life. I see it as important that each generation of musicians present their views of this music. In so doing they participate in a kind of dialogue with the past generations of artists, whose recordings of Beethoven we so well know. Each time-period has its own soundscape and musical ideas." Jumppanen is currently in the process of writing a book on Beethoven's Piano Sonatas. He has also written the liner notes for the new Ondine recording.